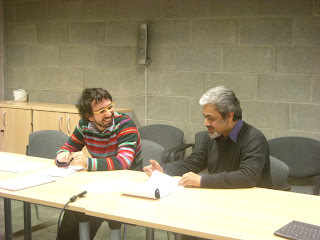 The second workshop focusing on the concept of practice - organised by Dr. Cristiano Storni-took place today in the IDC . During the first one - back in July- we focused more on the theoretical aspects (some resources are listed here). Guided by a list of questions formulated by Cristiano, Anders Sigfridson and Parag Deshpande presented their own perspectives on the concept and the way they each use it in his PhD work. What are straight forward illustrations of a "practice" in my data, research, field notes? What does the concept add to my understanding of my empirical problem? What do I gain using this concept/lens in my case study/research? What are the limits of the concept and how do my data and case study challenge its aspects? What it would mean to design for a practice? What it would mean to design a practice? Anders' perspective is connected to his previous participation in the socGSD project that studied globally distributed software development (GSD) projects, and looked at it as a social activity in an environment mediated by information technology and computer-aided software engineering (CASE) tools. The aim was to unveil and explain the non-canonical work practices (as compared to espoused practices) through which people actually achieve GSD. Within this frame, Anders' thesis work investigates the locally situated practices through which members of software development teams in global projects build up and apply knowledge. On the other side, Parag's perspective has its foundations in his own practice in architecture for over 15 years, following what it is known as the self-conscious (Alexander, 1964) view on design which relies on the architect/designer to guide him during the activity of design. Looking at interaction design as a design discipline, his PhD thesis is aimed to critique how design and the activity of design are understood in interaction design research. 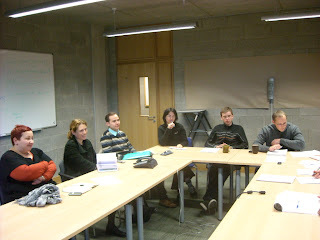 The nine participants had a very interesting debate trying to unveil the intricacies of the concept. Posted by Gabriela at 11:08 p.m.